At the Geek Offices’ Holiday Party late last month, Geek Offices members were talking about the quality of our coworking environment and the reasons for their continued membership, many for over three years. Geek Offices doesn’t have free beer on Thursdays, seminars on finding the right VC or a March Madness NCAA pool. We don’t bake cookies or host wellness classes but can point you to the vending machine across the hall or the Pilates studio down the street. Orange cushion chairs are not in our lobby. What we do offer is a serious, low-cost coworking environment, where, without interior distractions, members can discuss assignments in our lunch room or at our community conference table, shut an office door to complete a project, put in ear phones while researching an article, or animatedly argue over the latest plot twist in the their new video game. Geek Offices coworking has a nice mix of group discussion and individual effort. Members at the Holiday Party agreed that, in a personality test, Geek Offices members would be introverted but with a fair amount of extroversion. Hey, we’re in a coworking space so we can get down to work while being surrounded by others, not sitting in our bedrooms in our Inman Square walkup. If you want the ability to get things done while being in the company of like-minded workmates, then you should tour Geek Offices in Inman Square and see our available offices and work stations. With Clover, 1369 Coffee House, Kimchi Kitchen, Bukowski’s, All-Star Sandwich and 30 other restaurants and bars nearby, all of the excitement doesn’t have to be inside the coworking space. 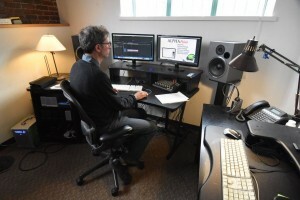 Two private offices are now available at Geek Offices coworking space in Cambridge’s Inman Square. One, a corner office, an 11′ by 15′ space shown here, is available immediately and rents for $950 for 1 person. The other private office, a 10′ by 13′ space, rents for $850 for 1 person. Need space for more than 1? We currently have 10 additional work stations available at our coworking space. Each additional member is $150 per month up to a total of 5 individuals and comes with its own dedicated coworking work station. 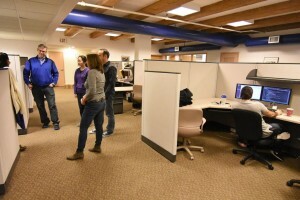 Want to see our Cambridge coworking space in person? Email us at info@geekoffices.com and we’d be happy to set up a tour. Are you part of a non-profit or startup looking for flexible coworking space in the Cambridge area? If so, check out our private offices and coworking space in the Inman Square neighborhood of Cambridge. Start up companies and groups looking for shared coworking space in Cambridge and greater Boston will find that Geek Offices provides some of the most affordable coworking space in the region. Geek Offices is a coworking space offe ring all the amenities of a professional, furnished office, with none of the overhead. Compare Geek Offices to the prices of other startup and incubator or coworking spaces in Boston and Cambridge and you’ll be pleasantly surprised by the value our coworking space offers. Now Available; Corner Office at Geek Offices Coworking! 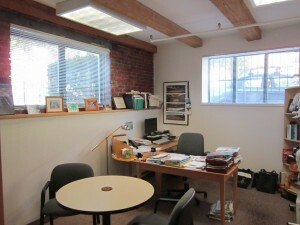 A private, corner office is now available at Geek Offices coworking Space here in Cambridge’s Inman Square. Come and get it before it’s gone! GeekOffices coworking offers dedicated work stations as well as a limited number of private offices, the latter of which are usually fully occupied. We now have a private, corner office, an 11′ by 15′ space, that is available immediately and rents for $950 for 1 person. Need space for more than 1? We currently have 10 additional work stations available. Each additional member is $150 per month up to a total of 5 individuals and comes with its own dedicated work station. Want to see the space in person? Email us at info@geekoffices.com and we’d be happy to set up a tour. Are you part of a startup or non-profit looking for flexible coworking space in the Cambridge area? If so, check out our private offices and coworking space in the Inman Square neighborhood of Cambridge. Start up companies and groups looking for shared coworking space in Cambridge and greater Boston will find that Geek Offices provides some of the most affordable coworking space in the region. Geek Offices is a coworking space offering all the amenities of a professional, furnished office, with none of the overhead. Compare Geek Offices to the prices of other startup and incubator or coworking spaces in Boston and Cambridge and you’ll be pleasantly surprised by the value our coworking space offers. Geek Offices would like to extend a warm welcome to one of the newest members in our coworking space, CONTINUUM Landscape Architects. 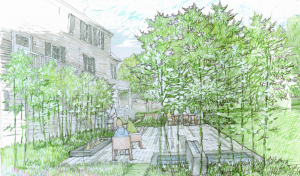 CONTINUUM is a landscape architecture consulting firm founded in 2015 by Michael White, a licensed landscape architect and LEED AP accredited professional with 13 years of design and construction experience. CONTINUUM provides design services for private, institutional and corporate clients. You can check out some of their work here and here. Are you a creative type looking for flexible coworking space in the Cambridge-Boston area? If so, check out our private offices and coworking space in the Inman Square neighborhood of Cambridge. Geek Offices is a coworking space offering all the amenities of a professional, furnished office, with none of the overhead. Groups and companies looking for shared coworking space in Cambridge and greater Boston will find that Geek Offices provides some of the most affordable coworking space in the region. Compare Geek Offices to the prices of other startup and incubator spaces in Boston and Cambridge and you’ll be pleasantly surprised by the value our coworking space offers.